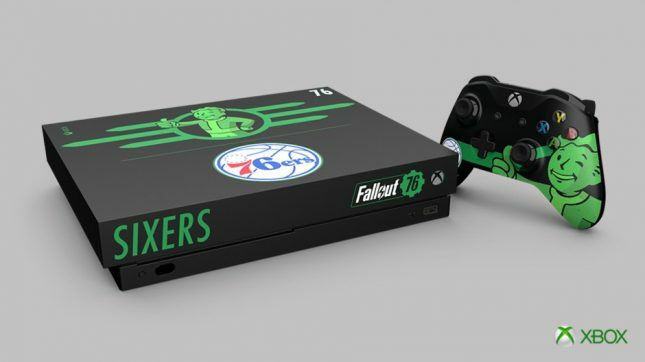 Fans of the NBA team the Philadelphia 76ers and the Fallout 76 video game have a new custom console that they might be able to win. The custom console is a tie-up between Microsoft and the team that has cool green graphics on a black console. Microsoft also stated that players should, “Keep an eye out on @Xbox, @Fallout, and @Sixers social handles for upcoming reveals, and an opportunity to win your very own “Radioactive” bundle.” Other than the custom graphics the Xbox One X console used is the same as any other. Microsoft should offer special bundles with graphics as cool as this one, more people would buy bundles if it did. The Fallout 76 bundle that is available includes a normal console, 1-month Xbox Game Pass trial, and 1-month of Xbox Live Gold.